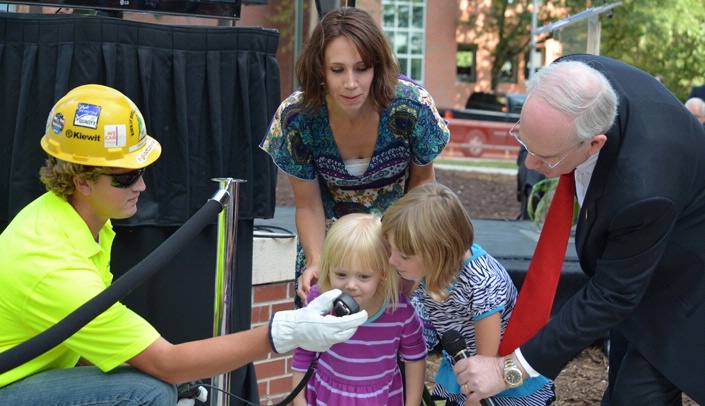 A Kiewit representative helps Emily Stephenson, 3, and sister Julia, 5, signal for the beam-raising as their mom, Amy Stephenson, looks on with UNMC Chancellor Jeffrey P. Gold, M.D. With that cry from 3-year-old Emily Stephenson -- echoed by her 5-year-old sister, Julia -- the first signed beam was raised to the top of the Fred & Pamela Buffett Cancer Center. For a photo album of the beam raising, click here. Emily Stephenson, who her mother said is being treated at Nebraska Medicine for a blood disorder, may have been the tiniest VIP in attendance, but she was as enthusiastic as any of the other cancer center supporters. See beam signings throughout Nebraska here. Omaha Mayor Jean Stothert was on hand to extend congratulations on the construction milestone, saying the tower cranes on the Omaha skyline point to "a future of growth." See campus leaders discuss the impact of the Fred & Pamela Buffett Cancer Center here. 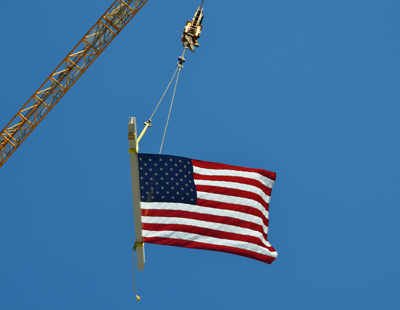 The signed beam, with the U.S. flag attached, is hoisted to the top of the Fred & Pamela Buffett Cancer Center. Calling the project "a commitment to save lives," Mayor Stohert said the Fred & Pamela Buffett Cancer Center will provide important job opportunities before and after the building is completed, adding $500 million to the local economy. Speaking before the beam-raising, UNMC Chancellor Jeffrey P. Gold, M.D., welcomed faculty, staff, donors and local officials, including Mike Yanney and Gail Walling Yanney, M.D. ; Ruth Scott; representatives from the Cattlemen's Ball; Omaha City Council members Pete Festersen, Chris Jerram and Ben Gray; state Sens. Jim Smith, Merv Riepe, Sue Crawford, Al Davis, Bob Hilkeman, Rick Kolowski and Mark Kolterman; and former U.S. Sen. Ben Nelson and others. "This is truly a great day for our campus," Dr. Gold said. "This facility represents how health care will be delivered in the future, and also how our campus will integrate clinical care, discovery and education, all for the benefit of our patients. It's really an exciting day." Ken Cowan, M.D., Ph.D., director of the Fred & Pamela Buffett Cancer Center, pointed out that it would only be 18 more months before the group gathered again for the center's opening. 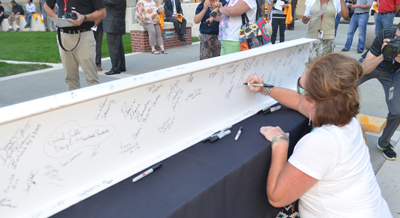 Nebraska Medicine staff and UNMC faculty, staff and students, came out -- along with donors, campus and community leaders and other supporters -- to sign the beams and see them raised. "Tremendous progress has been made, and every day we are closer to this state-of-the-art cancer center that will really transform Nebraska, the region and the country," Dr. Cowan said. Nebraska Medicine interim CEO Rosanna Morris said that when the Fred & Pamela Buffett Cancer Center opens, "it will have everything our cancer center patients need, all in one place. How do we know? Because we've involved physicians, reseachers, staff members and -- most importantly -- cancer patients in every aspect of the design of the facilities. "We know, and they know, that curing cancer is not just about eradicating cancer cells," she said. "It's about so much more. It's about treating the whole person - mind, body and spirit." The "topping off" ceremony Tuesday at the Fred & Pamela Buffett Cancer Center marked the completion of the structural framework for all floors of the 10-story research tower and the 8-story patient care areas in the $323 million facility. The 615,000 square-foot building is scheduled for completion in the spring of 2017. It is one of the largest projects ever for the state of Nebraska and the largest for the University of Nebraska. It is estimated that the Fred & Pamela Buffett Cancer Center will provide 1,200 jobs at the medical center and 4,657 new jobs to the metro area. It will infuse $537 million annually into the economy. Nine different beams were raised during the ceremony. Over the past six months, the beams traveled more than 2,000 miles around the state with people signing the beams at such events as the Cattlemen's Ball, the Ambassador of Hope Gala, and the Nebraska Science Festival.